The Mirroring Cure (2006)16mm transfer on dvd. 27min. 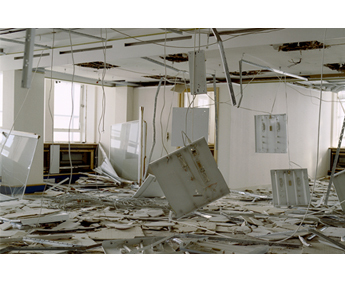 Tracing the life of a large construction site from demolition to the completion of new office space, 'The Mirroring Cure' focuses on people’s relationship to their built environment, highlighting the complexity of personal identities formed through being at work. The film is told from the point of view of the company secretary who has decided to carry out interviews with those employed around her. We witness her fascination with one of the architects whom she discovers suffers from a loss of balance, exacerbated by the large scale of the site. She becomes intrigued by the bizarre and surreal cure he develops to cope with his affliction. Cutting between ‘live’ interview footage and scripted action the film incorporates fictional and documentary elements leaving the viewer unsure as to where reality lies.